The classic children's series has arrived on DVD which celebrates Paddington Bear's 50th anniversary who was created by Michael Bond (writer) and illustrated by Peggy Fortnum. Although this bear migrated from Darkest Peru with his old bush hat, suitcase and marmalade sandwiches, he has become an English institution with his politeness and appeal that children of all ages will love. Our loveable bear also resides with the Mr. and Mrs. Brown with their daughter Judy who collected Paddington from a train station with a label around his neck stating, "Please look after this bear. Thank you" and from that day on, Paddington became history. Interestingly enough, in Peru, Paddington was actually called Pastuso and that like the Queen, Paddington has two birthdays a year. How's that for your fun fact for today! Featuring over 3 hours of original Paddington Bear episodes, this is definitely the definitive collection and add in another 2 hours of extras and you have everything you need to not only reminisce but also allow another generation of children to experience this English legacy. Featuring great stories, some humour and a classic that can never date. 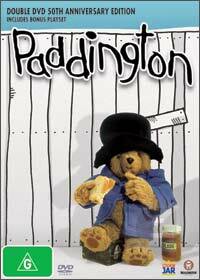 Paddington paper doll playset to construct, providing hours of Paddington fun.